To say the very least, it has been a most fascinating week. It is not everyday that a fellow has an opportunity to compare the stark contrasts of technological evolution from two different centuries. First, courtesy of the Historic Vehicle Association, there was the opportunity to see, feel, touch, hear, and even smell the technological innovations of 1915 made manifest in a Ford that was manufactured one hundred years ago. As a bonus, I was able to observe that vehicles performance in its native habitat on the National Old Trails Highway. Next, an opportunity to experience the technologies of the 21st century. After a great deal of deliberation I reluctantly decided to upgrade and expand on my Microsoft Office software as I am using a 2008 version. Well, I submitted payment, hit “Install” and stared at the screen informing me that they were aware of the system issues. Then I called customer support. After almost one hour on hold I can testify to the fact that they play hideous music, on a loop. On occasion they did break in to inform me that Windows 10 is available. I am always amazed by the size, dominance, and profits of a company with such poor customer service. At least the time on hold was well spent as it was an opportunity for lunch in a hectic day. In fact the entire week has been rather hectic but interesting. In a meeting with the promotions and events director for the Ramada Kingman we were able to finalize a structure for an electric vehicle weekend linked to Chillin’ on Beale this coming October, and the Route 66 Association of Kingman open house on September 8 that will include a special ceremony for Dries and Marion Bessels, inductees into the Route 66 Walk of Fame. Speaking of the Route 66 Association of Kingman and Chillin’ on Beale, this Saturday evening at 8:00 PM the classic film Edge of Eternity is being shown on the corner of Fourth Street and Andy Devine Avenue. The association is sponsoring the movie night to expand on the activities during Chillin’ on Beale. Bring your chairs and friends and enjoy an evening of classic cinema under a desert sky. For those unfamiliar with this movie it was a major production in the 1950’s that was filmed in Kingman, Oatman, and the surrounding area. The Ramada is moving forward with plans to become the cities only Route 66 resort. 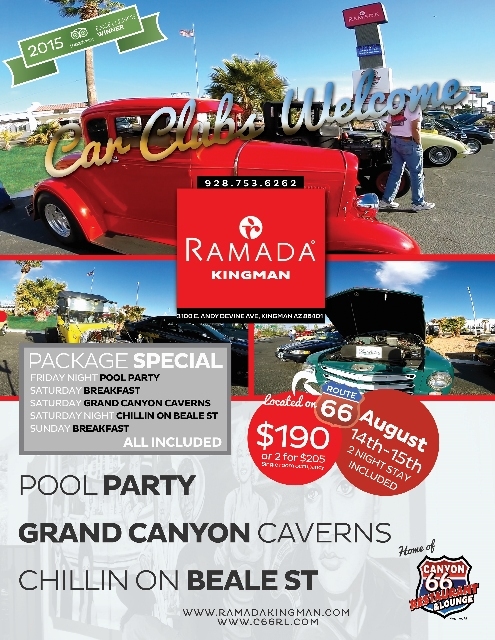 An excellent example of how that company will enhance and expand on events in Kingman is found in the promotion for a special package that transforms Chillin’ on Beale next Saturday evening into a full weekend of fun filled activities. Details need to be finalized for the electric vehicle weekend but initial plans for call for a wide array of activities. In addition, several new additions to the Route 66 Electric Vehicle Museum will be on display. More on that in just a moment. Meanwhile, a few major events are shaping up to be full fledged Route 66 extravaganzas. The first is the Birthplace of Route 66 event scheduled for this next weekend. Then, on the weekend of September 25, there is the Best of the West on 66 event in Kingman. This unique festival blends the cities rich association with Route 66 and its western heritage. Car shows and rodeos are but a few of the fun filled activities scheduled. Of course the big event of the year takes place on the weekend of October 31 in Edwardsville, Illinois. The Miles of Possibilities event is reminiscent of the U.S. Highway 66 Association conventions that blended the business of Route 66 with fun filled activities. On the schedule for the coming week is a trip to Grand Canyon Ranch Resort to discuss ways I may assist with promotional development. This should be an interesting adventure. Then there is an opportunity to visit with Wolfgang and Anja Werz, friends from Germany. We always look forward to their visit but since Anja wasn’t able to join us at de Prael in Amsterdam this past January we are even more excited about the pending visit. 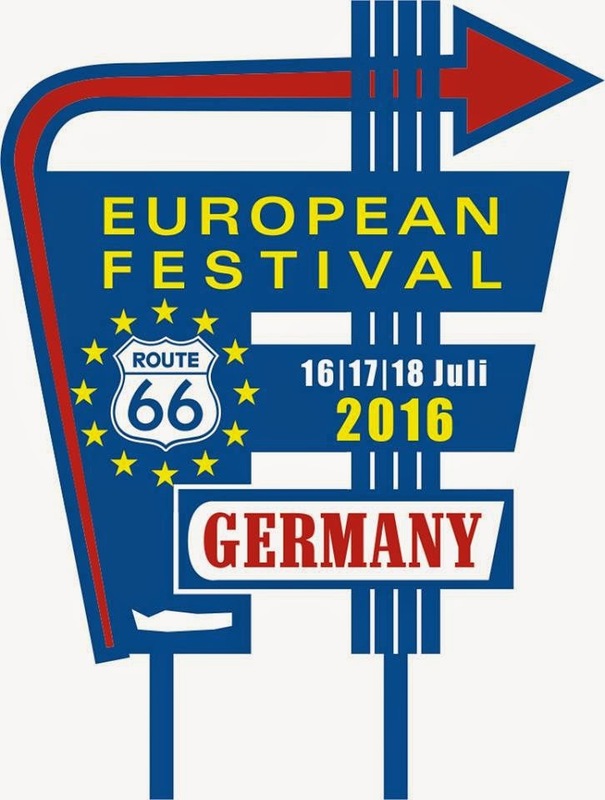 As they are the primary organizers behind the European Route 66 Festival scheduled for next July, I am sure the conversation will be most exciting. I am also quite confident that there will be more than a few updates to provide afterwards. As a close for this mornings post, I suppose a few pending developments would be appropriate. Several new additions are being added to the Route 66 Electric Vehicle Museum housed in the Powerhouse Visitor Center. One of these is Gone Postal, an amazing piece of electric drag racing history. I do not have an exact date for delivery to the museum but it should be before the end of the month. The transformation of the historic Dunton Motors facilities is ongoing. In addition to housing my future office (stop by if your in the neighborhood) the classic vehicle dealership is adding some interesting displays to create a one of a kind museum. The latest addition is Searchlight Sally, a legendary racer in the area. The vehicle will also be making an appearance at Chillin’ on Beale on Saturday, according to Scott Dunton. Bring some ear plugs for this one. Just a note on your frustrations…Get an iMac… The transition is not bad at all. As far as commenting on the rest of your blog entry, I wish I could live your life! You do great work!